Willowbridge Bridge No 99 is a major waterways place minor waterways place place on the waterways major waterways place village town city on the Grand Union Canal (Grand Junction Canal - Main Line - Gayton to Brentford) between Hammonds Bridge No 97 (1 mile and 1½ furlongs to the north) and Marsworth Junction (Junction of Grand Union Aylesbury Arm with Main Line) (14 miles and 4¼ furlongs and 16 locks to the south). The nearest place in the direction of Hammonds Bridge No 97 is Milepost - Braunston 40 Miles; ¾ furlongs away. 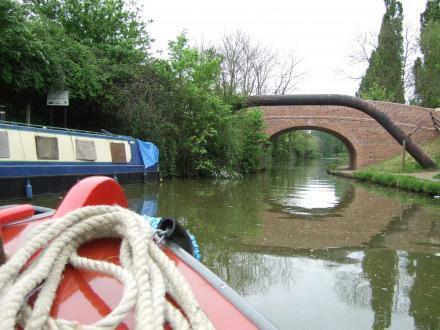 The nearest place in the direction of Marsworth Junction is Willowbridge Pipe Bridge; a few yards away. Milton Keynes — 238 yards to the northwest. Milton Keynes — 1441 yards to the northwest. Milton Keynes — 1397 yards to the north. 39 Barton Road, Milton Keynes, MK2 3HW — 1393 yards to the northwest. Registered Office 7 Hexham Gardens Bletchley, Milton Keynes, MK2 3HW — 1441 yards to the northwest. Saffon Street, Milton Keynes, MK2 3AH — 1467 yards to the north. Tiffany Close, Milton Keynes, MK2 3NA — 1446 yards to the northwest. Barton Road, Milton Keynes, MK2 3HW — 1425 yards to the northwest. IncTablet Electronics L21 Bletchley Business Campus, 1-9 BartonRd, Milton Keynes, MK2 3HU — 1413 yards to the northwest. Milton Keynes — 1424 yards to the west. Islay Court, Jersey Drive, Newton Leys, Milton Keynes, MK3 5QW — 1554 yards to the southwest. Milton Keynes — 211 yards to the south. Milton Keynes — 1554 yards to the southwest. 39 barton road, Milton Keynes, MK2 3HW — 1441 yards to the northwest. 29 Mill Road, Bletchley, Milton Keynes, MK2 2LB — 1391 yards to the north. Milton Keynes — 1488 yards to the west. Bletchley Business Campus,Unit L46, 1-9 Barton Road, Milton Keynes, MK2 3HU — 1400 yards to the northwest. 29 Skye Crescent, Milton Keynes, MK35AY — 1516 yards to the west. Bletchley — 1471 yards to the northwest. Bletchley Business campus, 1-9 Barton road,, Milton Keynes, MK2 3HU — 1413 yards to the northwest. 38 St Helena Avenue, Milton Keynes, MK3 5FL — 1404 yards to the west. Brora Close, Milton Keynes, MK2 3 — 1212 yards to the northwest. Willowbridge Marina, Stoke Rd Unit 1a, Milton Keynes, MK2 3JZ — 129 yards to the south. Unit 30, Barton Road, Milton Keynes, MK2 3LE — 1635 yards to the northwest. SKS Cars Ltd Unit L13B Bletchley Business Campus 1-9 Barton Road, Bletchley, MK2 3HU — 1413 yards to the northwest. Bletchley Business Campus, Unit L16 – Office,, 1-9 Barton Road, Bletchley,, Milton Keynes, MK2 3HU — 1413 yards to the northwest. 1-9 Barton Rd, Bletchley, Milton Keynes, MK2 3HU — 1413 yards to the northwest. 42 mill road bletchley, Milton Keynes, MK22LD — 1281 yards to the north. Unit 57 Barton road industrial estate, Milton Keynes, MK2 3BS — 1635 yards to the northwest. 18 Cornelia Close, Milton Keynes, MK2 3LX — 1493 yards to the northwest. Milton Keynes — 238 yards to the west. Coronation Hall, 3 Stoke Road, Bletchley, Milton Keynes, MK2 3AB — 1350 yards to the north. Milton Keynes, MK3 5 — 1591 yards to the west. Galley Lane, Milton Keynes, MK17 9AA — 1107 yards to the east. 69 Barton Road, Unit w, Milton Keynes, MK2 3HU — 1471 yards to the northwest. Milton Keynes — 1403 yards to the northwest. Sycamore House, Drayton Road, Milton Keynes — 1377 yards to the northwest. Milton Keynes — 1413 yards to the northwest. 176 Water Eaton Road, Milton Keynes, MK2 3AQ — 1574 yards to the north. Milton Keynes — 1410 yards to the northwest. 1 Barton Road, Milton Keynes, MK2 3HU — 1357 yards to the northwest. Furzey Way, MK3 5SP — 1308 yards to the west.